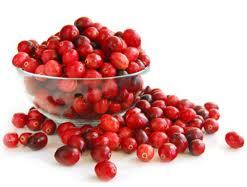 Cranberries are often a popular part of holiday celebrations in the form of cranberry sauce, cranberry drinks and dried cranberries added to stuffing, casseroles or dessert, but did you know they have the following health benefits? Fibre – high fibre intakes are associated with significantly lower risks for developing Coronary Heart Disease, Stroke, Hypertension, Diabetes, Obesity, and certain gastrointestinal diseases. Increased fibre intake has also been shown to lower blood pressure and Cholesterol levels, improve insulin sensitivity, and enhance weight loss for obese individuals. Vitamin E – a fat-soluble antioxidant involved in immune function that may help prevent or delay the chronic diseases associated with free radicals.